Simone Murray frames her study of British feminist presses with Virginia Woolf's comment from Three Guineas about the importance of the private printing press for ensuring ‘intellectual liberty’. Woolf herself had that freedom to say what she wanted, how she wanted through the Hogarth Press, established by her and her husband, Leonard. However, as Murray's commentary ably shows, quite what is meant by publishing independence is a fraught issue. Murray could have equally framed her account with another comment from Woolf. In A Room of One's Own, the narrator suggests for the woman of Newnham and Girton a whole series of neglected research topics that would contribute to a re-writing of history to include women. In Mixed Media, Murray finds her own neglected project. Feminism's limited interest in publishing history is equalled only by publishing history's similar disregard for feminism. Thus, Murray has to track down her sources in newspaper articles, interviews, trade journals and the occasional article in a feminist journal. Like Woolf, the search for an established corpus of research entails a confrontation with near-empty shelves. I say ‘British feminist presses’ though this is not entirely the case. Virago, The Women's Press and Pandora are the main focus of Chapters 1, 2 and 3, respectively, while the smaller radical feminist presses – Onlywomen Press, Sheba Feminist Publishers and Silver Moon Books – feature in Chapter 4. But Murray does make some comparisons with American and Australian presses – The Feminist Press and Spinifex Press, for example – while Chapter 5 on feminist bestsellers concentrates on American authors with the exception of Germaine Greer, Australian but long resident in the UK. Murray's study of that ‘Golden Age’ of feminist publishing in the last 30 years of the 20th century serves two invaluable purposes. Firstly, with comprehensive detail, it tells a story that has never been told and was at risk of being lost and, secondly, it unpicks the mythology that has surrounded, particularly, Virago and The Women's Press. Far from reaffirming the history of a financially independent, collectively organized and politically cohesive vanguard, Murray uncovers a more complex and less idealized narrative about economics, editorial control and corporate partnerships. In the selling of what she calls ‘capitalist feminism’, political principles always battled against commercial viability: it was the high moral ground or the bottom line. Murray convincingly illustrates the struggles involved in feminist publishing, but as the book develops the argument becomes rather repetitive. The model Murray sets up is one of oppositions – principle versus expediency, activism versus intellectualism, independence versus (depending on one's political perspective) judicious co-operation or sell-out – and every specific situation replays these antagonisms in one form or the another, if only to point out the difficulty in maintaining them because of the inter-dependency between the mainstream and the margins. Hinted at within the study are possibilities which, if developed further, might have helped Murray to find a theoretical discourse equal to her careful and always illuminating empirical data. For example, Robert Darnton's ‘communications circuit’ is discussed in the Introduction, found wanting and not returned to again, except in passing comments. Similarly, remarks about capitalism's amazing capacity to appropriate the oppositional underpins her exploration of mainstream publishing and feminist bestsellers but is not foregrounded. I wondered, at times, whether Pierre Bourdieu's concept of cultural fields might have helped Murray find a way of mapping feminist publishing that would recognize the opposing forces she writes of while also accommodating the endlessly shifting play of distinction. Murray's Afterword looks to the future, to a period when, as she says, both terms, ‘feminist’ and ‘publishing’, are facing uncertain times. As she rightly indicates, it is too precipitate to discount print in favour of digital technology when women's access to print has been so recent and hard won, when there is clearly much still to be said about women's publishing history and when the book is, anyway, showing itself to be a highly resilient medium. Bringing into relation digital and book technologies, Murray ends with a series of strategies for the survival of feminist publishing and the interesting suggestion that feminism's focus should be on intellectual property which would manifest itself in a variety of media. Hence, returning to Woolf and her printing press, Murray concludes that the emphasis in these early years of the 21st century should be more on controlling the message than the medium. Certainly Murray's ‘message’ is one that needs to be heard. 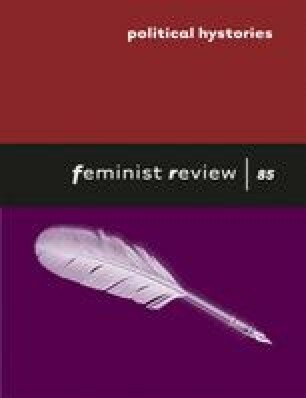 The academic initiative in feminist publishing, which Murray discusses in Chapter 3, rapidly took a theoretical turn and feminists were in the curious position of theorizing gender with scant consideration of the political meanings of the medium, processes and institutional contexts in which their words were being produced. Murray has provided a very necessary corrective.